Автор: Интернет Собор. Author: Internet Cathedral. Дата публикации: Date of publication: 26 июня 2018 June 26, 2018 . .Категория: Московская Патриархия .Category: Moscow Patriarchate . в Украине и возможность легализации украинских раскольников. .... and the possibility of the legalization[i.e. canonically ABSORBING? under Moscow, of the 'Ukrainian schismatics'.[i.e. the UOC-Kiev Patriarchate..the main rival Ukrainian jurisdiction to the UOC-MP]. V. Putin's outrageous & bloody and destructive invasion into neighboring largely-Orthodox Christian, Ukraine, seizing territory from Ukraine, and of his fomenting and arming his! criminal and gangster anti-Ukrainian forces, inside of Ukrainian territory, .thus forcing loyal Ukrainians [which includes many who personally see themselves as 'Russians' & who mainly daily speak the Russian language, but who are loyal to their NATIVE-Ukraine as their beloved nation!.. [and many Ukrainians are married to Russian wives or husbands], .and not to Putin's captive & non-free neo-soviet, concocted 'Russian Federation', ,.... to fight back against Putin's invasion, to FORCEFULLY REPELL THE EVIL INVADERS! - TO SHOOT BACK!..many average Ukrainians are turning against everythingconnected to Moscow, which their UOC-MP -a large church organization located all over Ukrainian territory, which takes all of its marching orders from Moscow and Putin and his puppet-MP, is a logical target, most especially as many of its clergy and church properties, have proven...in many public exposés, and by photographs of the huge arms-stashes for the pro-Putin's armed illegal insurrectionists, criminals, stored in MANY UOC-MP churches and monasteries, IN UKRAINE! to be actively full and unashamed co-operating ....supporters of Putin's shameful and murderous military and economic and political intervention and subversion of their Ukrainian nation. By what bloodthirsty and power mad, 'democratically and freely elected'....RF-President Vladimir Vladimirovich Putin and his captive MP have done and are still doing in and to Ukraine, guarantees, that modern post Czarist old Russia, and post-Soviet Russia,... Ukraine will NEVER be 're-united to Mother Russia'! ......NEVER! Vladimir Putin, and all of those deluded living, Russians who co-operate with his evil world-power schemes and military adventurism. And in the meantime, the Ukrainian 'Greek-Catholic' Uniates, are making much progress, in gaining more Ukrainian converts to their church!...even as their own Pope is selling them out to please and to court the 'ecumenical' favor of Putin and his MP!...for the Vatican's power politics....as usual....what the fallen-away popes have been busy at for many long centuries. 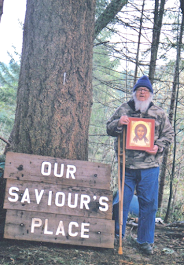 Reader Daniel Everiss, just an average and loyal typical Midwestern American citizen, in Oregon, WHO USES THE MIND THAT THE GOOD LORD GAVE ME, & WHO CARES ABOUT THE TRUTH!, because.....GOD IS TRUTH!....and who is loyal to Holy Orthodoxy and to our canonical ROCA and its solidly Orthodox Primate, Vladyka Metropolitan Agafangel (Pashkovsky). MANY YEARS!, MNOGAYA LETA to him and to his Holy Synod and Faithful Believers. Архиереи заслушали сообщение Блаженнейшего Митрополита Онуфрия и постоянных членов Священного Синода Украинской Православной Церкви о встрече делегации УПЦ Его Всесвятейшеством, Константинопольским Патриархом Варфоломеем и членами Синода Вселенского Патриархата, состоявшейся 23 июня в Стамбуле. The bishops heard a message from His Beatitude Metropolitan Onufry and the permanent members of the Holy Synod of the Ukrainian Orthodox Church-MP, rfegarding the meeting of the delegation of the UOC-MP,by His Holiness,EP-Patriarch Bartholomew of Constantinople and members of the Synod of the Ecumenical Patriarchate, which meeting was held in Istanbul on June 23. 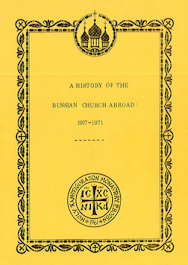 In particular, it was reported that the Patriarchate of Constantinople denied truthfulness of the publicized information that the canonical mechanism for overcoming the schism in Ukrainian Orthodoxy had allegedly been finally agreed upon, and the [proposed]- Tomos's text on the autocephaly of the Ukrainian Church has already been formulated and drawn up. Не подтвердилось и то, что одностороннее предоставление Украинской Церкви автокефалии должно состояться в ближайшее время или в какие-то определенные сроки. It was also not confirmed that the unilateral provision of autocephaly to 'The Ukrainian Church' should take place in the near future or on certain dates. Зато, архиереи Константинопольского Патриархата показали готовность своей Церкви присоединиться к процессу преодоления украинского церковного раскола в консультации с братскими Поместными Православными Церквами. On the other hand, the bishops of the Patriarchate of Constantinople showed their Church's readiness to join the process of overcoming the Ukrainian church schism [i.e. the 'schism from the MP' of Kiev-Patriarch Filaret and his UOC-Kiev] in consultation with the fraternal Local Orthodox Churches....i.e. [of 'world-Orthodoxy']. To this end, the delegation of the Patriarchate of Constantinople will meet with representatives of theMP-Russian Orthodox Church in the near future. Заслушав сообщение, Преосвященные УПЦ имели рассуждения о перспективах Украинского Православия в современных исторических обстоятельствах. Having heard the message, the Reverend-Head of the UOC-MP, had discussions about the prospects of Ukrainian Orthodoxy in modern historical circumstances. В частности, было высказано беспокойство относительно возможности создания в Украине параллельных церковных юрисдикций, о чем появилась информация в прессе. In particular, concern was voiced about the possibility of creating parallel ecclesiastical jurisdictions in Ukraine, as information appeared in the press. Архиереи отметили, что такое развитие событий не преодолеет, а углубит церковный раскол. The bishops of the UOC-MP, noted that such a development of events will not overcome, but will rather negatively deepen the church schism. В случае же преобразования Украинской Православной Церкви в структуру Константинопольского Патриархата, наша Церковь потеряет значительную часть прав, которыми она наделена за последние десятилетия. In the event of the transformation [sub-summing, absorbing]of 'The Ukrainian Orthodox Church' into/under the structure of the Patriarchate of Constantinople, our Church will lose a significant part of the rights that it has been endowed with over the past decades. В связи с этим, епископы Украинской Православной Церкви - участники архиерейской совещания 25 июня 2018 в Киево-Печерской Лавре единогласно приняли совместное заявление об этом. In this regard, the bishops of the Ukrainian Orthodox Church-MP- participants in their bishop's meeting on June 25, 2018 in the Kiev-Pechersk Lavra unanimously adopted a joint statement on this. Имеющийся канонический статус вполне достаточен для того, чтобы Украинская Православная Церковь плодотворно совершала свою миссию среди народа Украины. The existing canonical status is sufficient to ensure that the Ukrainian Orthodox Church fruitfully has accomplished its mission among the people of Ukraine. Попытки изменить этот статус приведут только к ограничению прав и свобод, которыми наделена наша Церковь, имея права широкой автономии. К тому же, эти попытки не вылечат, а только углубят раскол как в украинском Православии, так и в украинском обществе в целом. In addition, these attempts will not cure, but will deepen the split in both Ukrainian Orthodoxy and in Ukrainian society as a whole. 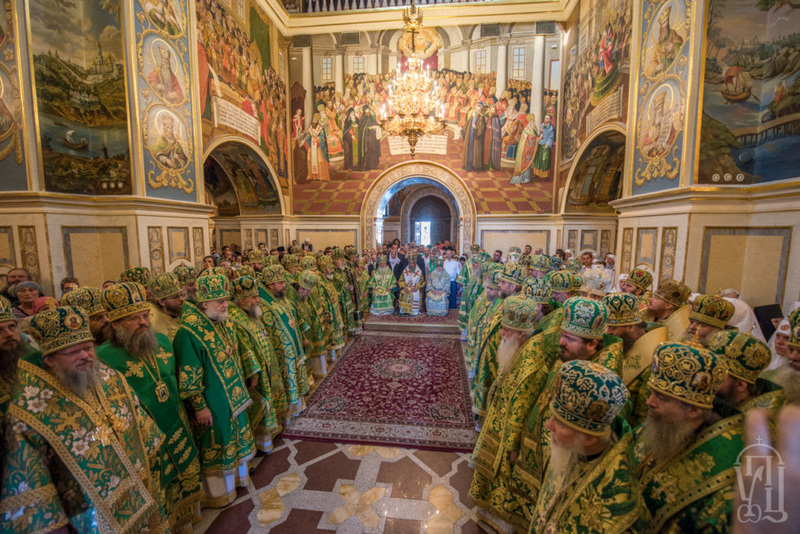 The bishops unanimously confirmed their desire to observe their episcopal oath given at their ordinations to keep their faithfulness to the Ukrainian Orthodox Church-MP...[.i.e. 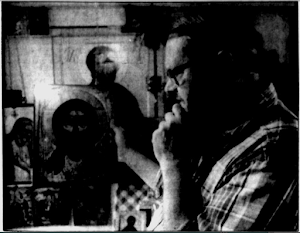 to be in continued obedience to their superior church, 'The Mother Russian Church'- theStalin founded in 1943, his totally uncanonical and bogus and apostate, 'Moscow Patriarchate'].